While many people spent Sunday, February 1st preparing for the Super Bowl, many craft beer enthusiasts were also celebrating International Gruit Day. Gruits are an interesting style, they are beers brewed without hops, using other herbs and spices for flavor and balance. For centuries beer was made with a wide variety of ingredients including local blends of spices used for flavor. Unfortunately some less scrupulous brewers added dangerous chemicals to their beers in place of higher quality ingredients. This led to Reinheitsgebot, a German beer purity law enacted in Bavaria in 1487 that required all beers to be brewed with only hops, malt and water (limited knowledge of microbiology led to the exclusion of yeast, but it was in there). This definition of beer spread throughout Europe, and while some styles included added flavorings (like Belgian witbiers), hops became the standard ingredient for flavoring and bittering beer. While the vast majority of beers are still made with hops, there is a movement amongst certain brewers to brew innovative beers with other natural flavoring agents, and International Gruit Day is their way of encouraging drinkers to try some of their creations. Locally this has been spearheaded by Cambridge Brewing Company, Mystic Brewery, and Earth Eagle Brewings, who all served a series of gruits yesterday in celebration. I tried one of my first gruits this weekend, Mystic Brewery’s Melissa, an ale brewed with lemon balm, juniper and lavender. Mystic Melissa pours a tangerine orange with a fluffy white head. The smell is very floral and herbal, you definitely detect the lavender and juniper. The first taste reminded me of an upscale herbal iced tea, very different from most beers but interesting. The herbs lead the flavor, notes of lemon, tea, lavender, spice and pepper. This is balanced by some mild malt flavor, touches of crackers and grain. I would guess that Mystic uses one of their house yeast strains to ferment this beer, but the fruity and spicy esters are pretty muted compared to Mystic’s saisons. The beer is light bodied and goes down smooth at 7.0% ABV. 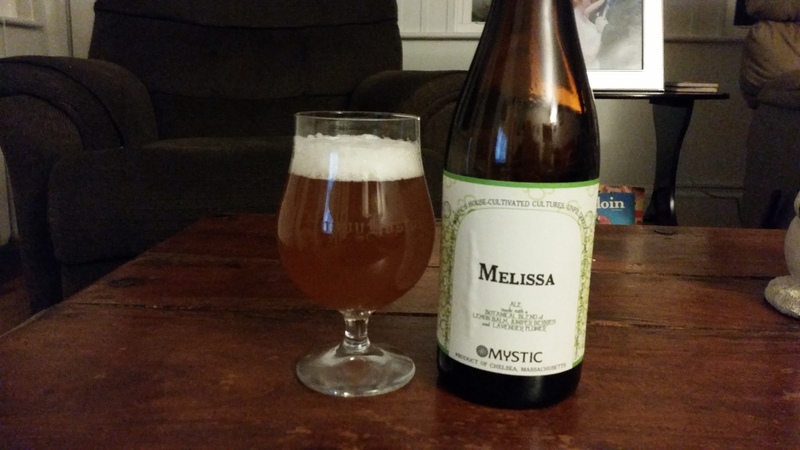 Overall Mystic Melissa is very unique, but drinkable and enjoyable, I would definitely be interested in trying some of their other takes on the gruit style. Hoppy Boston score: 4.0/5.